Our partners know that CFEF’s consumer and financial education programs make a measurable and positive impact on the communities we serve. Our community initiatives, innovative approaches and untiring commitment to improving lives through financial education all translate into stronger communities. In turn, we also help to build capacity among the partners with whom we work so our reach and impact is even greater. * Imagine knowing exactly how consumers are progressing and performing as they learn. * Imagine recognizing exactly what your community needs and organizing thoughtful, actionable, instant responses. * Imagine understanding – and improving – the behaviors of those you help over weeks, months, even years, to build upon the success of your programs. * Imagine doing all of this easily, seamlessly and in real time. 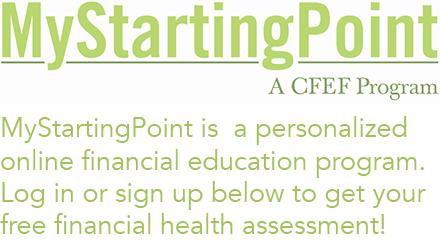 MyStartingPoint is a proven solution to your community’s financial education needs. It is simply the most powerful way to administer, manage and customize the educational experience for the people you serve. The outcomes are measurable. The impact is real. Email us to find out how you can partner with CFEF.